SAN FRANCISCO — A broad coalition of organizations gathered on the steps of City Hall last week to launch a campaign to increase by $25 million the share of funds in the next city budget for programs serving human needs. They presented their vision of a city whose residents are nurtured and supported, not driven out by soaring costs, dwindling services and growing violence. Participants from a range of neighborhood, youth, senior, transgender, anti-violence and other organizations joined in emphasizing the urgent need for more affordable housing and rental assistance, affordable child care, job training for low-income parents, and violence prevention services, to help stem the exodus of low- and moderate-income families from the city. Several expressed regret at the narrow defeat of Proposition A, a ballot initiative that called for increased funding for homicide-prevention activities, in the June 6 primary election. Supervisor Ross Mirkarimi, who serves with Daly on the budget committee, said, “Today’s budget process speaks to what kind of San Francisco we will have 25 years from now. We cannot afford a lack of vision that fails to protect those who can’t protect themselves.” Calling the request for $25 million “a pittance,” Mirkarimi urged that $50 million be added to the city’s human needs funding. Among the coalition’s key demands are for more and improved child care facilities; major investments in violence-prevention programs, including expanding street intervention for young adults, expanding re-entry services for ex-offenders, and more help to gun violence victims at S.F. General Hospital and through saving the S.F. Trauma Center, slated to close in November. The group has also demanded more job training and services for youth; new funding to offset losses in HIV/AIDS-related services; more help for immigrants, seniors and disabled people; and greater funding for community arts and cultural centers, parks and recreation in underserved communities. 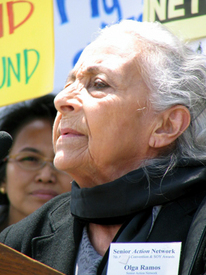 Among participating organizations were Coleman Advocates for Children and Youth, Senior Action Network, the Living Wage Coalition, the Coalition on Homelessness, Chinatown Community Development Center, La Raza Centro Legal, and the Immigrant Rights Response Network.